Antoinette “Toni” Harris and the all-new RAV4 Hybrid compact crossover shatter perceptions and leave assumptions in the dust in Toyota’s commercial for this year’s Super Bowl. 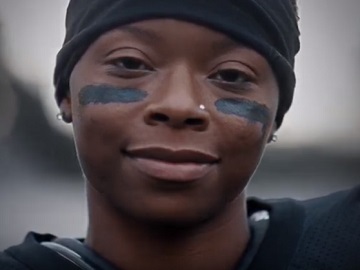 The automaker has enlisted the defensive back end for the East Los Angeles College Huskies, who will be one of the few women ever to play college football, to star in the ad for the Big Game, which also aims to deliver an empowering message. “They’ve said a lot of things about Toni Harris,” the voiceover says at the beginning of the 60-second film, listing then some of those things, while onscreen images take viewers on a journey back in time, showing Toni’s evolution over the years, her efforts to reach her goals, as well as her career highlights. “They said she was too small. They said she was too slow. Too weak. They said she’d never get to the next level. Never inspire a new generation. Never get a football scholarship,” the voiceover says, concluding that “people have made a lot of assumptions about Toni”. The next shot features Toni at the wheel of a Toyota RAV4 Hybrid, completing the sentence. “But I’ve never been a big fan of assumptions,” she mentions, giving a quick look to the camera before switching the driving mode and speeding up a curvy road. “And neither have we,” the voiceover adds, speaking on behalf of Toyota and introducing the hybrid “that will shatter perceptions,” the all-new, “built for speed RAV4 Hybrid. The all-new 2019 RAV4 Hybrid models – LE, XLE, XLE Premium, Adventure and Limited, starting at $25,500, will be available this spring. The commercial, from multicultural agency Burrell Communications, marks Toyota’s appearance in the Super Bowl for the second straight year. In 2018, the automotive company has three ads – two 60-second spots and one 30-second ad.